As old as the Tarot is let’s remember that symbolism is not fixed and that traditions can and do evolve. If we think about this as a natural progression and want to use the cards as a tool for the 21st century then how we interpret tarot meanings becomes a process that is constantly evolving like us! Aside from the historical aspect of the Tarot, which is laden with powerful symbolism, we bring tarot meanings up to date by viewing the cards as a living tradition of creative inquiry. The Tarot meanings here are a blending of the old traditional interpretations and my own new age perceptions and experiences of working with the cards. We begin with the 22 Major Arcana, meaning Great Secrets – how wonderfully mystical! These cards reflect the Soul and its metaphorical journey as it travels through life’s many cycles. The images describe both the inner state at a particular point in a person’s life and the outer experience, which occurs as a result. Starting Tarot meanings with the Fool we travel through the various stages and rites of passage; gaining insights along the way. In part one of Tarot Meanings for the New Age we will deal with the following cards. For both the invocation and banishment exercises – light a candle and place the card on your altar. Spend some time contemplating the meaning and how it relates to your intention. Keywords: Willingness, risk, taking a leap of faith. Tarot Meanings – The Fool is the hero at the start of his journey indicating the beginning of a stage, process or effort. It’s an action card that calls one to be spontaneous and take risks. It’s about trusting in the self, being willing to move forward independently and daring to follow that dream. Blockages show up in the form of negative, childish behaviour. Doubt and uncertainty breed fear and this lack of confidence can prevent the manifestation of ideas and the starting of any venture, job, relationship or habit. Invoke the Fool’s energy at the time of a new moon when you need help with starting anything new. He will push you to take those first steps! Banish any false starts, foolish or workaholic behaviour with the help of the waning moon and the Fool. Affirmation – I take a leap willingly! Tarot Meanings – The card of the Magician shows the effective use of power to direct energy wherever it is needed. He symbolises the focus to bring about change and make things happen. His appearance indicates all skills for practical matters are being used with confidence to get the required results. He knows how to use the power of intention to get what he wants. Blockages show up as the misuse of power for selfish gain – hidden agendas. The Magician becomes the trickster and manipulates to suit his own end. Mistakes are caused by breakdowns in communication rather than lack of ability. Invoke the help of the Magician with the energy of the full moon when you need to strengthen your focus. Visualise your intention, get to work with a plan and make the right creative choices with his guidance. Banish all forms of trickery and distractions that take you away from your purpose – with the Magician’s help and the waning moon. He will lead you to understand how better to protect yourself against negative influences. Affirmation – My intention is focused in the right direction! Tarot Meanings – Guarding the secrets of the unconscious, the message of the High Priestess is to study the wisdom within and look beneath the surface of a situation. She embodies the magical knowingness of the feminine principle and sees what is not always obvious to others. Her appearance guides us to seek this knowledge of ancient truth in spiritual study and apply it to our own life. Blockages show up as a lack of harmony with the inner self. Reading too much into situations as a result of being too caught up in the intuitive nature and not balanced and grounded enough in the physical aspect of life. Invoke her energy with the full moon to reveal any hidden knowledge, help with spiritual studies and understanding your dreams. Place her on your altar, bedside table or under your pillow for extra oomph! Banish all suppressed feelings and unhealthy secrets with the waning moon and the High Priestess. Affirmation – I allow the unknown to reveal itself! Keywords: Potential, creativity, nurturing, growth. Tarot Meanings – The archetype of the Great Mother is found in the Empress, portraying nature and nurture, indicating a time to plant seeds and gestate something in our lives. As we tend to our creations we learn the art of nurturing and how to nourish ourselves and our relationships. She teaches the true meaning of abundance – to be happy with what we have, which is everything we need. Blockages appear when ‘smothering’ can be an issue and emotional neediness is showing up. Unable to let go of outgrown relationships and neglecting the self indicates a reversal of Empress energy. Invoke her creative energy with the waxing moon to help growth in any area of your life and she will enrich you with her fruitful abundance! Banish any destructive and draining relationshipswith the Empress and the waning moon, or to slow down anything that is moving too fast. Affirmation – I am grateful for an abundant life! Tarot Meanings – The masculine qualities are predominant in the Emperor who symbolises what drives us towards our ideals and the discipline and foresight needed to achieve our goals. His appearance is a reminder that we each have ultimate power over our own life and often turns up to highlight organising abilities and promotion. Blockages show up in the form of a controlling and forceful energy and/or inability to make decisions and take responsibility. Being out of touch with feelings and stubborn and rigid behaviour can turn into aggression. Invoke the authoritative energy of the Emperor with the full moon to empower the self and strengthen resolve. He will help you to be assertive and take charge of your life! Banish any controlling attachments and domineering related energy with the help of the Emperor and the dark side of the moon. Affirmation – I am assertive and powerful! Tarot Meanings – The Hierophant is a guiding authority representing conventional forms of spiritual law. In contrast to the High Priestess, he guides us to seek wisdom from an outside source and could be a priest, doctor, teacher or spiritual mentor. Blockages show up as intolerance towards people whose religious or spiritual beliefs are different. Advice sought may not be the right kind. Loss of faith. Invoke the Hierophant on a waxing moon to find the right guide for your spiritual pathway. Banish all false beliefs and blind faith with the aid of the waning moon and the Hierophant. Affirmation – I find the answers I am seeking! We will continue with Tarot Meanings for the New Age in part two with more of the Majors’ but meanwhile if you do find the time to try the exercises and work with any of these cards. Until the next Tarot Time, magical blessings to you all! 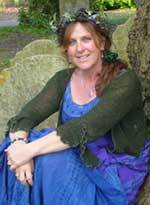 Any questions regarding Tarot meanings please use the Facebook comments below. 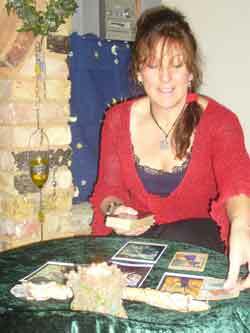 Sheena Cundy is a Witch, Healer, Tarot Reader, Horse Riding Teacher, Musician and Writer, she can be contacted via her website www.sheenacundy.weebly.com for Spiritual Readings, Spiritual Healing and Horse Riding Lessons. In her spare time she sings with her band Kundalini Drive www.myspace.com/kundalinidrive. Her other time is spent being a wife and mother, squashing as much writing in as possible in between walking her dogs and avoiding the housework. This entry was posted in Tarot, Runes and Divination and tagged affirmation, astrology, creativity, feelings, harmony, high priestess, intuition, major arcana, tarot, wisdom. Bookmark the permalink.